This Deluxe B&H Kit consists of a Manfrotto MT190CXPRO3 Carbon Fiber Tripod with a MHXPRO-3W 3-Way Pan/Tilt Head. Also included in the kit are an extra quick-release plate, a tripod strap, tripod case, bubble level, and a stone bag. These accessories will both help protect your tripod, and make it easier to capture quality images. Holding up to 15.4 lb of gear, and with a maximum height of 68.1" the tripod features a Quick Power Lock System that allows you to completely extend the tripod legs with just one hand. Once set up you can use the MT190CXPRO3's rapid center column in standard vertical mode or swing it into horizontal position like a boom with Manfrotto's 90° column feature. Enlarged tabs on the individual leg angle selectors allow you to get down low for macro work with the column in horizontal mode. And once you're down there you can attach any of Manfrotto's flexible or articulated arms to hold lights or reflectors via the Easy Link plug built into the tripod's spider. The MHXPRO-3W is a compact 3-way pan/tilt head with retractable handles that can be extended as needed. Two knobs control the friction for the front-to-back and side-to-side tilt, allowing you to fine tune the movements based on the weight of your gear. A 200PL quick-release plate with a 1/4"-20 camera mounting screw is included with the head, and this kit provides an extra plate as well. The black, redesigned MT190CXPRO3 Carbon Fiber Tripod from Manfrotto builds on the success and popularity of the previous 190 series with professional hardware and convenience features that make it even easier to use than its predecessor. When the three leg sections and center column are fully extended, the tripod reaches a maximum height of 63", and its load capacity of 15.4 lb makes it a good choice for larger cameras. The tripod weighs 3.5 lb, and folds down to 24" for transport. Set up is faster than ever with Manfrotto's Quick Power Lock System that allows you to completely extend the tripod legs with just one hand. Once set up you can use the MT190CXPRO3's rapid center column in standard vertical mode or swing it into horizontal position like a boom with Manfrotto's 90° Column feature. Enlarged tabs on the individual leg angle selectors allow you to get down to only 3.5" for macro work with the column in horizontal mode. And once you're down there you can attach any of Manfrotto's flexible or articulated arms to hold lights or reflectors via the Easy Link plug built into the tripod's spider. This XPRO 3-Way, Pan-and-Tilt Head from Manfrotto has a load capacity of 17.6 lb and can be attached to tripods or other support systems that feature a 3/8"-16 mount. It includes an integrated RC2 quick release cam lock and a 200PL-14 Quick Release Plate. RC2 compatible quick release plates such as the 200PL-14 can be removed from the head by pulling the cam lock's spring-loaded lever, which also allows the plate to be quickly reattached. The cam lock also features a safety catch to prevent the 200PL-14, or another compatible quick release plate from accidentally disconnecting. Cameras, sport optics, or camcorders that are compatible with a 1/4"-20 mount can be connected to the quick release plate before securing it to the pan-and-tilt head. The head can be rotated 360°, tilted 90° forwards or 30° backwards, as well as 90° sideways for portrait orientation. Each of these three movements function independently of each other, have dedicated control handles, and can be locked into place. In addition to integrating the ability to individually lock the movements by twisting each corresponding handle's rubberized grip, the telescoping control handles for both tilt functions can also be retracted while the head is not in use for more convenient storage or transport. To promote fast and repeatable device positioning, this XPRO 3-Way, Pan-and-Tilt Head also includes a dedicated angle scale for rotational movements that is designed for easy visibility, as well as dedicated control knobs set under the telescoping control handles that can each be rotated to apply tension control to either the backwards and forwards, or sideways tilt movements at any time. 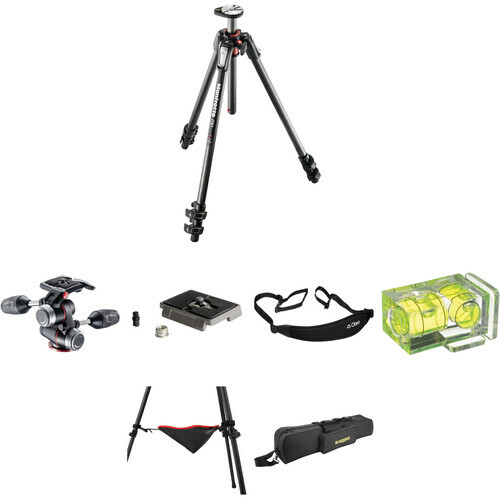 Box Dimensions (LxWxH) 25.9 x 5.4 x 5.3"
Box Dimensions (LxWxH) 6.5 x 6.4 x 6.2"
MT190CXPRO3 Carbon Fiber Tripod with MHXPRO-3W 3-Way Pan/Tilt Head Deluxe Kit is rated 4.0 out of 5 by 1. Rated 4 out of 5 by Anonymous from good quality product. good quality product and the delivery was fast and tax free.